I have a lot to do, with so little time. But, with all of this, I can’t just take this movie away from my mind – I’ve decided to drag everyone in this. An impromptu goodbye party for Professor John Oldman becomes a mysterious interrogation after the retiring scholar reveals to his colleagues he never ages and has walked the earth for 14,000 years. Interesting isn’t it? Now did you notice the hero’s last name was a pun? This is a very simple movie having complicated and complex questions with straight forward answers. You are meeting a guy who is Fourteen thousand years old and imagine the type of questions you have for him, when he’s ready to answer ’em. Or, do you think he’s just a fake, who just wants to pull your leg? This movie satisfied me with the type of questions that I wanted to ask to a man, who’ve lived this long. I can’t believe how I’ve missed this movie so far and would definitely thank the man who shared this with me! 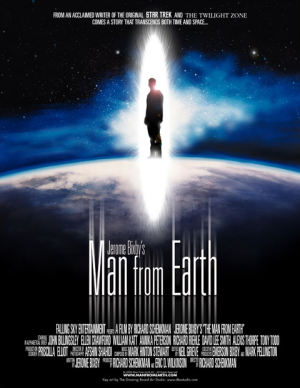 What makes this movie more interesting [than the actual synopsis shared above] is the audience, who get to ask questions to the so called the man who walked Earth for 14 thousand years. Six professors [a Biologist, a Psychiartrist, an Art-History professor & a religious, an Anthropologist, a Historian, and an Archaeologist], knowing very well in what they teach and a young, but a not-so-naive-student. When the ‘what ifs’ and ‘how coulds’ are being answered, you’ll feel yourself drawn into the movie, frame some questions of your own, which will, be asked and answered later on! The movie also has twists and turns, some of them will be unexpected and just tells you the wide imagination, the writer had! This is no action movie – no super powers – pure drama-science-fiction and the questions and answers are the swords and shields! There is actually a suspense as to if he really is 14 thousand years old or not in the movie, but in the end, it becomes clear. I wish they didn’t clear that! Here’s some interesting dialogues which I loved from the movie [saved the best for the last]! I understand the movie, but I quite don’t get why they titled the movie this way! Highly recommended for those who love fiction! Have you heard of a 55F? It’s 55 fiction… as the name indicates, is all about keeping it short to exactly 55 words while building something fictitious. For more you can check out the WIKI link, HERE. For those who hate reading long stories, Here’s a 55F for you! This is for a contest at office Blogs, why should the fun be limited? The look on his face said he was not kidding. How could she chose him? He always thought ‘he’ would be the last person she would choose. I was inspired by, and I wanted to inspire people too. This is a lengthy post, please spend some time – imagine the time and effort I spent to write this! This is about a series called “Doctor Who”, but please, don’t navigate away, you non-series addict people, what’s wrong in reading? There isn’t any pre-requisite for this post to be understood, so, please do read on. I’m emphasizing this because, most of my series related posts are the least read posts. This could very well be the only time I’m writing a dedicated post on a series. As you know, I’m a series addict, and this doesn’t come as a surprise to most of you that I’m in love with this series “Doctor Who”. Having said that, I want you to know that I’ve never enjoyed a series like this, the fun, the imagination and the deliverance, which “Doctor Who” had. I must tell you that I’ve seen a lot of series, but I have never spent any of my time to emphasize people to watch a series (only when they ask me about!) That is the amount of impact I’m having after finishing the 7 season Doctor Who. I can go on, but let me start to inspire you. Now, let’s begin. The series, Doctor who started 50 years back, in 1963. But, I haven’t seen all of it – it restarted again during 2005. There’s where my Doctor journey begun. This series is a Science Fiction, about a time travelling Alien – ‘A Time Lord’ from a planet called Gallifrey, who calls himself ‘Doctor’. No one knows his actual name, the reason behind the series name, Doctor Who? He looks like a human, with two hearts. There’s where my inspiration begun – two hearts! He mostly travels with a ‘companion’, a female, mostly a human. Now, the first question that arose in my mind after knowing about the series that begun during 1963 was, how a single person can be casted as a Doctor in all of the series. There should definitely be a recast. Yes, there was a lot of recast. 12 of them (Well, technically 13, but you’ll understand when you see) since the series begun. But, this is a science fiction series! So, they added a scientific reason for every recast! Now, I’m sure most of you would have seen our “Shakthimaan” where the enthusiastic journalist ‘Geetha Viswas’ was recast. Did they give you a reason why? Doctor who provides answer to almost everything around the series – it’s like you’re living and traveling along with the Doctor! 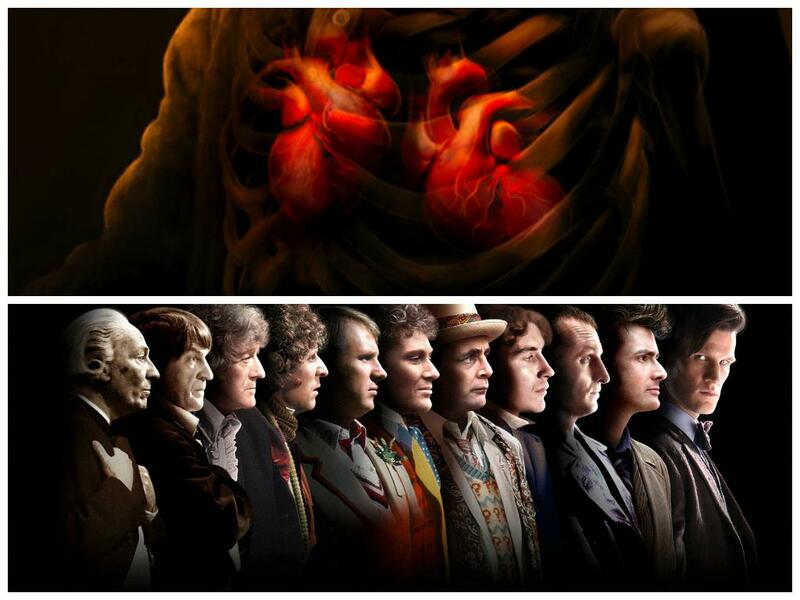 A picture of the two hears of The Doctor and the 11 Doctors, in the order from 1963 to 2013. The thing about recast is that, they almost never change. They do the same work – save people or sentimental or love someone (like Rachel Dawes in Batman Begins/The Dark Knight – the character never changed). But, after every recast, after ‘regeneration’ as they call it here, a new Doctor will take over the role. But, he will not be the same character as the previous actor, the director gives the actor his own space and to add his own essence to the actual character. For instance, my ‘first’ Doctor (the 9th Doctor), casted by Christopher Eccleston, repeats the word “Fantastic” very frequently. The next one, David Tennant, who took over the role, repeats the word “Allons-y” a French word meaning “Let’s go”. 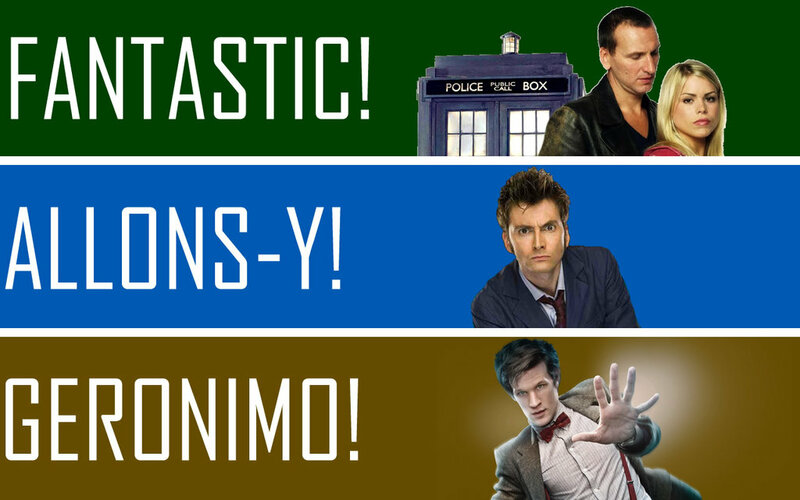 The next one, Matt Smith, the 11th Doctor, repeats two – “Bow-ties-are-cool” and “Geronimo”. The words that describes The Doctors. He calls his time machine a ‘TARDIS’ – Time And Relative Dimension In Space. It’s much more than a machine, it disguises as anything nearby where it’s landed. 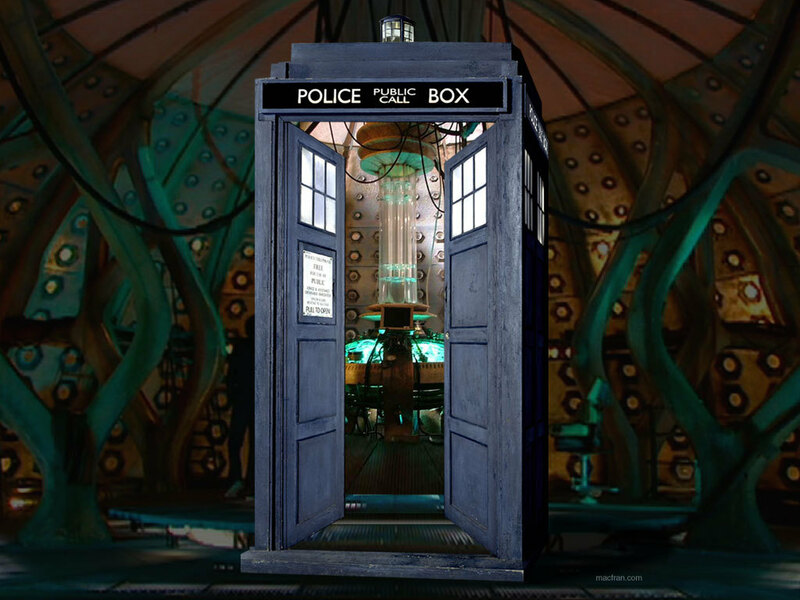 When it lands near a 1963 police box, one of its circuits is broken and is stuck in that shape forever. 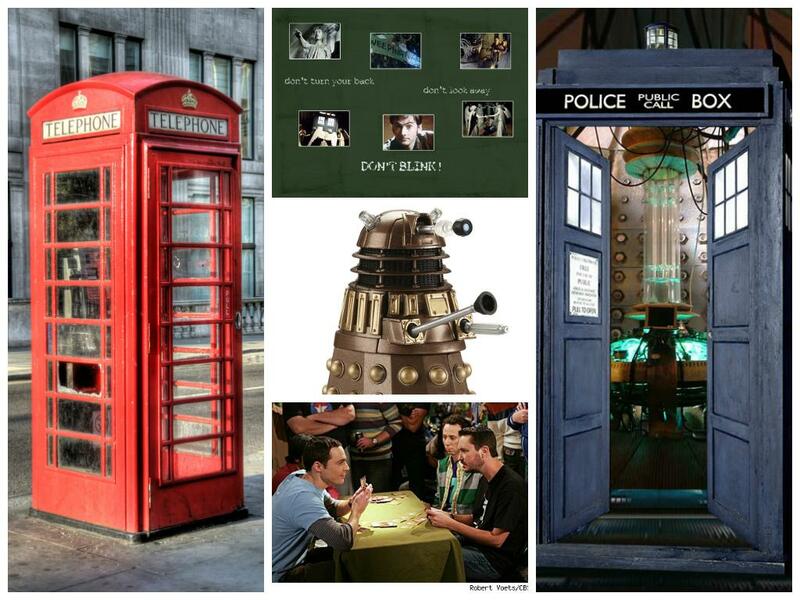 It’s like a police box, more like a telephone box, only bigger on the inside! The first look at itself, impress you! They call it a ‘Time Lord Art’ – like a 3D painting! It’s actually not the perfect time machine; it’s totally an unreliable one. Most of the time, the Doctor intends to go somewhere and it takes him somewhere else! That way, the fun goes on! The most lovable thing of the TARDIS is the sound of it when it’s landing, a cyclic wheezing, groaning noise, anyone who’s a Doctor Who fan, would love it! So, what does a Doctor do? Heal people? Save people? Milk money from the people? (Sorry, got distracted!) Well, since this is an alien Doctor, he (ofcourse) saves people, saves universe, saves earth, saves Aliens, and does a lot of savings. But, let me tell you – it never gets old and that’s not exactly what he does all the time in the series! The thing that makes you interesting is that, how he saves and who he saves. What more, who his enemy is. Time travel and outer world kindles your imagination, the Doctor faces a variety of enemies, and you’d be surprised that you might fall in love with the way an enemy was created. 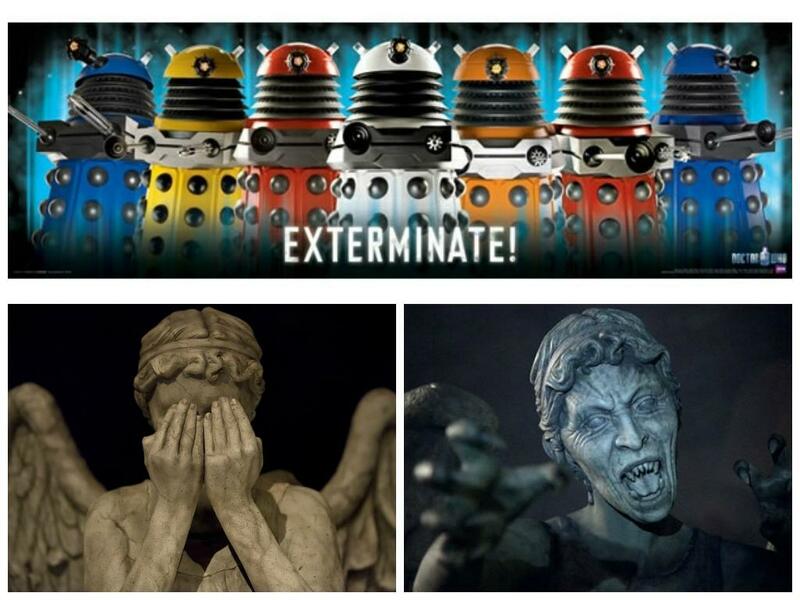 I was inspired by a lot of his enemies, but “The Weeping Angels” and the “Daleks” are one of the best! As I said, time travel and outer world kindles your imagination. Steven Moffat, the lead writer of Doctor Who said “What would be the point of having this job if I didn’t get to make up some of the maddest possible scenes I’ve ever had in my head since I was a kid?” He did create a lot of monsters – I love the weeping angels most among his other creations. This would be a spoiler for the future Doctor Who audience, but I couldn’t resist writing about the Daleks and the Weeping Angles. 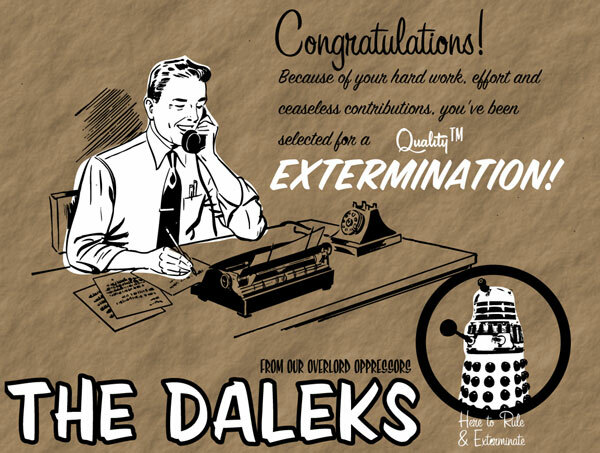 Daleks are another alien race, rivalry to the Time Lords. They’re like India and Pakistan. 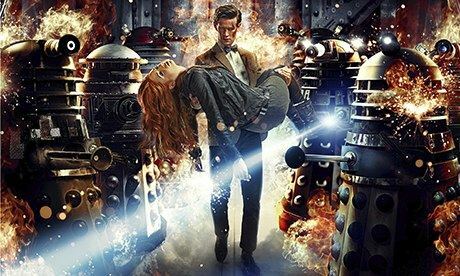 Now, you know about Time Lords – human alike with two hearts, but Daleks are just like a robot (not robot, robot, inside the metal case, there’s an alien creature!) with only one emotion – ‘hate’. They don’t have any other emotions, care only about the Dalek race and wouldn’t hesitate to kill any other race for no reason at all (just to show their supremacy), making them the dangerous creature who could wipe out the entire universe. The weeping angels on the other hand are like ‘Silent killers’. They look like an angel stone statue, only with their eyes covered by their own hands, disguising as a weeping angel. When you look at them, they won’t move. When you close your eyes to blink or move your eyes off them, they move towards you. And, when they touch you, you’ll never exist in the present, you’ll be sent to past! All the life that you would have lived, had the angels not touched you, will be theirs! Next time, when you see a stone statue, don’t blink! Not behind the Doctor Who scenes, but the in-between-time I watched Doctor Who this past one month. I’d been in constant touch with Ramanan – the fiction lover, who inspired/introduced me to Doctor Who as you might be familiar. We would discuss on the episodes that I watched previous night and he did his best without spoilers. I had a lot of doubts, and such a patient guy he was, he cleared all of them! I must say that I equally enjoyed having a likeminded person (I’m not sure if he thinks so because, he’s much more!) to discuss this mutual interest of ours. A couple of my bay-mates noted that I chat with Ramanan frequently, and their comment was “You talk to a ‘guy’ for such a long time? What do you guys talk?” The talks about the Doctors, the ‘wait’ period, about the classic who and even the female companions! We even continue our discussion via sms/whatsapp. It was one hell of a fun ride! 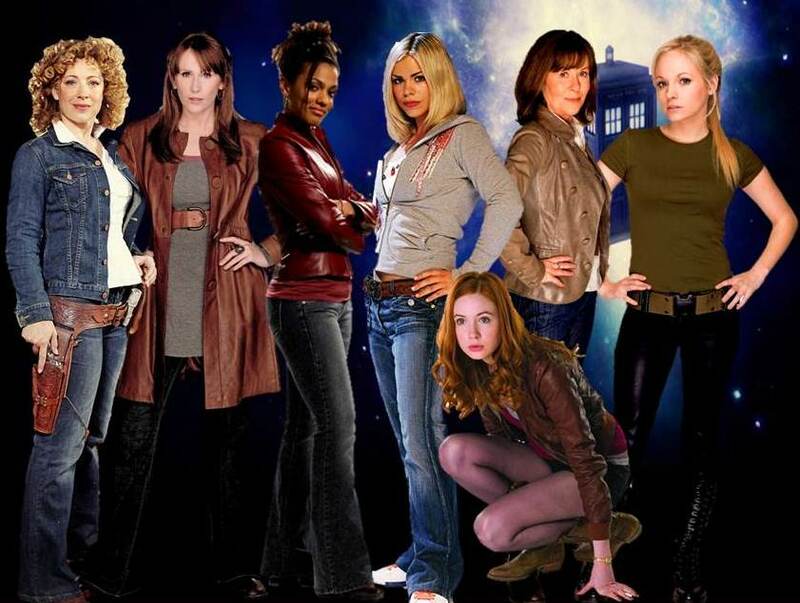 The female companions of the Doctors! After watching Doctor Who, you’ll feel very differently. You’ll look at things in a different way – like thinking twice about taking an eye of a stone statue. You will have more imaginations, if you’re a writer, you’ll suddenly have more creative ways to produce a story. When you come across a telephone booth, you’ll think of TARDIS. When you re-watch Big Bang Theory, you’ll notice that Wil Wheaton once wore a ‘Dalek’ T-shirt. You’ll have the itch to talk to someone who watched/watching Doctor Who. You’ll be inspired and you would want to inspire someone. The last movie I saw was over a month ago. After watching the mind blowing Doctors in the past one month, I decided to revisit my movie collections and guess what film I decided to watch – “About Time”, a movie about a time travelling man! Well, probably it’s not that bad of a movie, but my expectation after Doctor Who could have spoiled it! Before I finish, I want to tell you something. If you have watched ‘The Big Bang Theory’, you’d want a person like Sheldon Cooper. If you have watched Sherlock Holmes, you’d love to have a personal detective. If you have watched Shakthimaan, you’d want super powers. But, if you watch Doctor Who, you wouldn’t want anything, you would just want with the journey to go on and on! Right, then, thanks for your patience to read this long post; I hope I have inspired you. Let me know if you want the 7 season Doctor Who! See ya! Disclaimer: While the technology described in the story may come true, chances are they are my wild imagination and creativity. All characters appearing in this work are fictitious. Any resemblance to real persons, living or dead, is purely coincidental. “Now… Tell me. What could be his next target and what kind of action can we expect from him? Why do you think he does this? And how do you suggest we trap him?” Thiru asked CM’s Elite team. “Uh…” almost everyone thought aloud, no one coming up with a possible answer. “He could hack into cameras and look for people who might do some err… things. Or probably, take a snap of people committing crime.” One of the Elite said. “You know, we should actually be doing that. We’re not doing it and that’s why someone has decided to” said Thiru. Thiru was surprised to see a woman standing up and speaking with so much authority. “Why do you say that?” Thiru was suddenly interested in what this young IPS has to say as the last line caught his attention. All the Elite team knew, was there’s a man called Ram and if they could bring him, he could help them get the criminal. Anyone could form the rest of her theory. “Wow, you look beautiful for a hacker, Christy” Raji said and immediately liked her. “Why, you think the hackers will always have big glasses and cheetos in their hair?” Raji re-considered her previous decision. “I still don’t believe you talked me into your little – ‘quest’, you call it?” Christy said. (sighs) “I know, I’ll one day be proud for what I do next. So, are we here to work as a team? I prefer working alone” she said and Karthic immediately liked her. “I used to, too. But, not anymore!” Karthic said looking at her. “Come on guys, we have a lot to discuss.” Ram said, deciding on something. Ram finished talking to the group. Karthic, Raji, Daniel and Christy were looking at him as he was leaving. “I’ve found her. Valli was not easy to find – she covered her tracks well. I think I’ll have hard time bringing her in. She’s essential for this job and that’s the reason I’d spend so much time and now risk going out. Keep working – even if I don’t ever make it back. Remember the ultimate goal – that should keep you all motivated!” Ram finished and moved towards the garage. “What do you mean by ‘don’t ever’?” asked Raji, but he was well out of sight before she finished the sentence. There was silence all around. “Sir –” someone started speaking and Thiru looked at him as if he’s going to melt him using the fires from his eyes. He gulped and turned his gaze away. Some people looked at each other, but there was silence all around. Everybody started moving except for Vinoth and Savithri. Thiru called them close after closing the door of the conference room. “How are you sure?” asked Savithri. It’s been over a month since the White Knight had exposed the corrupt cops. Since then, every day, his website was updated with photos of corrupt cops, doing things. Until a week ago, it was just photos – but from last week, the photos had details of the cop – who he is and why he is committing a crime. The media feasted in it and described The White Knight as someone who could change the history of cops – history of crimes and history of India. Some of the celebrities, when asked about The White Knight, said they’d feature in a movie as ‘the-white-knight’! The-white-knight.com was updated. The media called it “Finally” and it said the following. The cops are now behaving; it’s time for people to behave. Warning: Misbehaving people will be, as usual, monitored and then a list of such will be given to the cops. Now, in a normal way you would think that’s cops’ job and you know how to handle cops – you’ve seen them, manipulated them. Remember, the morale of the cops had been boosted, so there’s only a little chance you’d be slipping. I’d been only finding faults in the cops, and forgot there are good cops too and how they got into trouble by staying out of it. Now I believe they are ready to serve the people. During this one month, I’d been watching people misbehave towards the cops, mentioning my name. This would not be the case anymore. “It was rather an unclear update as to whether the White Knight has stopped watching cops or started targeting people. It is true that we have also noted some people, despite doing wrong stuff, slip away from the hands of the cops, who perhaps were scared that their name would be coming up in the White Knight’s website if they take action. This update could be a dawn for the good cops and might create panic for people who make trouble. We are yet not sure on this, but we’ll probably know more very soon.” Said a media. “We’ll meet soon” he said and hanged up. “Who are you meeting?” asked Raji. “What do you want the algorithm to do?” she said, taking a seat near him. She started moving her fingers over the keyboard. Ram looked at her for a second and realized what she is doing. He’d been kept her out for most of his stuffs, but the time is really going fast and it’s only a matter of time before Thiru or someone catches him. He decided to make the most out of it and in his desperation; he had turned his wife into an accomplice. It’s all for the good cause, he said to himself. “Because, people believe. They’ve seen what happened to the vehicles and what happened to the mighty cops. They’ll be scared of what’ll happen to them. If they still don’t – well, that’s why we have cops, right?” he said, finishing his codes and getting up. “So, you know my real name?” he cut him off. “I have no idea what you are talking about.” For a moment, he went pale. “What do you want me to do?” he said, making up his mind. “My place. That’s what I call it. I’m Ram, by the way – you can call me so if you’d like to, Karthic!” they shook hands. Thiru was going over the list once again. He only had the list, but he had no idea where these guys are. He’d been trying his best, but he could not get a hold of anyone. How could these people be hiding like this? And, why are they hiding? He knows only one on the list is the White Knight and if that person is what he thinks he is, then it’d be hard to find him. He had already sent out the CM’s Elite team to work – their top priority being “Find Ram”. If Ram is not the White Knight, then Thiru was so sure that he could help him find the rest. He knows he was a glorified software engineer. After his only son’s departure, Ram had been out of the lime light and no one knows where he is. From what he heard, Ram took his son’s death as his own fault and has been punishing himself since then. All his friends didn’t know where he is and they last heard of him was about 7 months before. Thiru took a pen and circled Ram’s name on the list. As Mani started leaving the room, Raji entered. Thiru, The commissioner of police of the Chennai city was furious. He was one of the good police men, yet the fact that one man has left the entire Tamil Nadu become chaos in one day made him angry. While he tries to believe that the White Knight is trying to do something for a better future, his interference with the law has gotten into his temper. He was personally amazed by the thought of how the head lights still burst out after 2 days of the initial chaos, but he still believed that it was the last of what he calls a ‘stunt’ that the so called White Knight will make! He has had an earful during the urgent meeting scheduled by the Chief Minister of Tamil Nadu a couple of days before. The statement that he made before the chaos begun, had came back to haunt him. The CM has ordered an elite team to grab the White Knight at any given first chance. He was part of that team too. Earlier that day, he went on to read the-white-knight.com for his next move. There wasn’t anything on it other than a few movie super hero posters, but he’s been involving the best hackers around India to crack into the website and isolate the man. He has had no luck so far. “Come on, guys – give me a bone here” he said to himself. A whole week was gone and there was nothing the hackers could do to triangulate the so-called-super-hero. The update on the-white-knight.com earlier that day added fuel to the raging fire. When Thiru opened the page, he read the only line in between the super hero images. He immediately called for a meeting with the fellow police officers. The next morning, when Thiru woke up, he found a flash drive sitting beside his spectacles. Puzzled, he powered on his ‘Compaq’ and it took about 10 minutes to load his personal settings. He plugged in the flash drive and it had a lot of photos. A glance on the thumbnails gave him a good idea – those were the images of his fellow colleagues doing things that they’re supposed to catch people do. There was an odd-one-out – a Read Me.jpg. He opened the image and read out loud. He immediately went to the website. 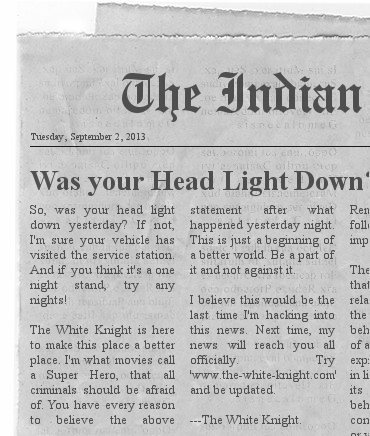 The-white-knight.com was updated and Thiru didn’t like a bit of it. The update said “Corrupt Police list has been handed over to the Commissioner of Police, Chennai City. Will the police take action against the police? They have 24 hours.” A timer was running, showing less than 23 hours remaining. His head started to take a spin. Assistant commissioner Marimuthu surprised Thiru with an early morning salute. ACP produced a flashing salute and left the place half hearted. By now Thiru realized that atleast half of the city police will want to know if their name is on the list or not. He decided not to waste a single moment and took a drive to the CM’s house himself. He was infact, afraid that his driver might want to know if his name was on the list! There were about 30 calls on his mobile during the 25 minutes journey from his house to the CMs. Only one was from the CM and he missed the others. The finger print search on the flash drive came up empty. CM was in a dilemma whether to suspend all the 341 cops in the photo or not and a team was identifying them from the photo. Time was tickling away and the media was already on it. A set of lawyers came rushing from the CM’s house and they said “No Comments” even before a question was asked. The place was chaos. Inside almost all of the police stations in Chennai city, a group of cops had gathered and were watching the televisions’ live update. After about 16 hours, as if waiting for a verdict on a murder case – the result was out. Thiru personally appeared on the television and delivered the news. Camera flashes were flickering for any given second. “What are you going to do to them?” asked Raji. It was dawn. The media and some interested people had been waiting for the-white-knight.com to be updated. Thiru was one of them. At 5 in the morning, when then timer reached 00:00:00, it was updated. One of the corrupted cops was in a deep sleep when that happened. He heard a loud sound and woke up with heavy breathings. He saw his family was also disturbed by that sound and he asked them to stay inside the house and went on to open the door of his house. What he saw was unbelievable. His brand new 72,000 rupees Bajaj Pulsar had a hole in the side of the petrol tank and the petrol was rushing outside, making a small river towards his gate. While he watched that in horror, a beggar, who made a fire to escape the early morning chills because of last night’s rain, was just leaving. A still burning paper from the fire went flying like in the Final Destination movie and landed at the banks of the newly formed river. The police officer’s family, whose sleep was disturbed by the first sound, heard another sound – the sound of 72,000 rupees burning. The whole city was peaceful except for the corrupt officers’ mind. The media went on to report none of the incidents happened as The White Knight threatened and people spent a peaceful day except for a few accidents. Another corrupt officer, who had been afraid to go out of the house that whole day, waited for a miracle to save his precious RX100 after he heard what had happened to the nearby police officer Sivamani’s Pulsar. It was almost 7 in the night and he needed a break. He went inside and switched on his hall lights. With a flash, his house electricity short circuited and the burnt smell of his Whirlpool refrigerator made him realize that he’d been punished. At 9:30 in the night, the-white-knight.com was updated. And it showed the lone Sivamani’s Pulsar on fire. Thiru was reading the update and he knew a few of the cops who were on the list were punished. He recollected ACP Marimuthu being on the list, and wasn’t sure if he was punished. Curious, he placed a call to him and almost thought he’d not answer, after 11th ring, he answered. “No sir, I was not punished. I think you overlooked!” he said, looking at the engine burst Scorpio. “How did you punish them?” asked Raji. “I will from now on, ma’am. I could use an extra hand though!” he said. “Alright, since you begged for it, I’ll join” she said with a naughty smile on her face. Introduction to the White Knight is here. Disclaimer: While the technology described in the story may be true, chances are they are my real imaginations and creativity. All characters appearing in this work are fictitious. Any resemblance to real persons, living or dead, is purely coincidental. His wife didn’t know about this. She’d have stopped him if she’d known what he’s about to do. But, it was too late. She is the only person in the world who knew he is the only person in the world who could do it. And he did it! The indiannews.com website didn’t know they were being hacked. He did so in a prime-time and displayed his message which couldn’t be taken off the website for atleast a day. He had hacked into the news website’s database server and hard programmed the news on the database like it’s a notice from the press to the public and its backup DB too. He took a deep breath and published the news. He said to himself, “One down”. The news went viral. The indiannews.com didn’t know that this had been published on its entire Tamil Nadu version. People started calling the company and asked who the White Knight is. They had no clue. Chennai commissioner went on to make a public statement that the news company didn’t know about this and people don’t need to worry about it. He said that it’s just a stupid computer genius who’ll get caught very soon for the nuisance that he created. She walked into his room. He was alone and having his regular JD, watching the commissioner’s statement on the news. She walked over to him with the breakfast she prepared and set aside. “It’s too early for a JD.” He didn’t respond. “You know why” he said. He let out a dry smile on that comment and clicked on a switch. The entire library that was before them started moving aside and a rack full of computer monitors started moving towards them. One keyboard popped up in front of him and he started typing codes. The coverage from another news channel showed some accidents because of the light bursts. It was chaos all around the city that night. At 9, a channel summarized the incidents happened on that night. About 30% of the vehicles were in the service center for a new head light and most of them were IT company buses that had about 6 lights on a side. “Stop this” she said after bursting into his room. He gave her a look and then started typing more codes. He stopped typing for a moment as if he heard what she said and then started typing codes again. “Are you hearing me?” she started coming forward as if she’s going to pull the keyboard from him. “I can hear you alright. Do you think I didn’t know accidents would happen when I planned this?” he was still typing. “No Ram. This is not you. You’ve taken junior’s accident seriously. You couldn’t have done anything to stop it. It’s not your fault!” She realized it too late. She walked over to him and gave him a hug. “I know Ram. I know what you’re trying to do. I just don’t like the way you do it” tears came down from her eyes too. There was a long silence once again and then he moved her aside and started typing more codes. She knew that nothing she could do to stop him. It’s that attitude that attracted her to him. “So, how did you do it?” she asked looking over the codes. “Are you interested in my vigilante program?” he said with a little smile. “Oh, this is just a beginning. A personal satisfaction, I would say. There’s lot more to come!” he said with a smile on his face. 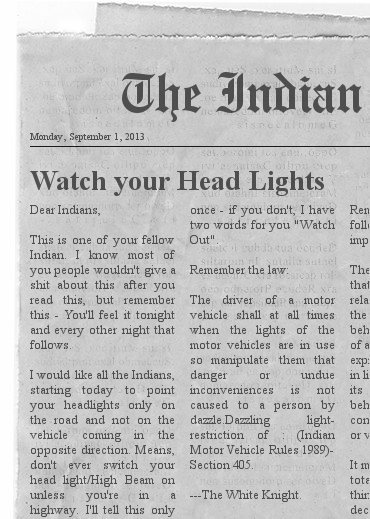 She looked up at the screen and a news paper column showed the message (Click on the image to get a better view). He was a glorified software engineer. Anything anyone asks him for, he’ll get it done – the maximum time he has taken to do so is 1 day. He had never switched company because, the company that he worked for made sure to raise his salary twice in a year – an exception that’s not even made for the CEO of that company. He infact negotiate/withdraw salary in US $s while working in India. He had everything he needed for his life – a good job, a loving and caring wife, good money (ofcourse!) and the blessings of his parents. He had been earning in $s for the last 10 years and there’s a talk going on that he’d soon be the richest man in India. He had multiple houses in and around most of the cities in Tamil Nadu, almost all the states in India and even a couple in the US of America. God is not the type who’d give only happiness to his fellow disciples, is he? He had issues too and the major one being his only son died in a terrible accident. With the wealth he had, he could have sued the lorry driver who hit his car and taking away his only child. The case was closed as an accident and the driver’s license was ‘punched’ once and he paid for the bail and walked away. After that night, he resigned his job and settled in the almost-farthest-end-of-India – a remote village near Kanyakumari. Six months passed and the world thought the emerging wealthy had lost his mind after his only son’s departure and very soon, forgot about him. Little do they know on what he was doing in that remote village or what comes the following day. Hello all, I’m new to wordpress and this is my first attempt at creating a ‘series’. I’ve created some short stories earlier and shared them through blogspot. I’m looking for wider audience and this is my attempt to widen my circle. 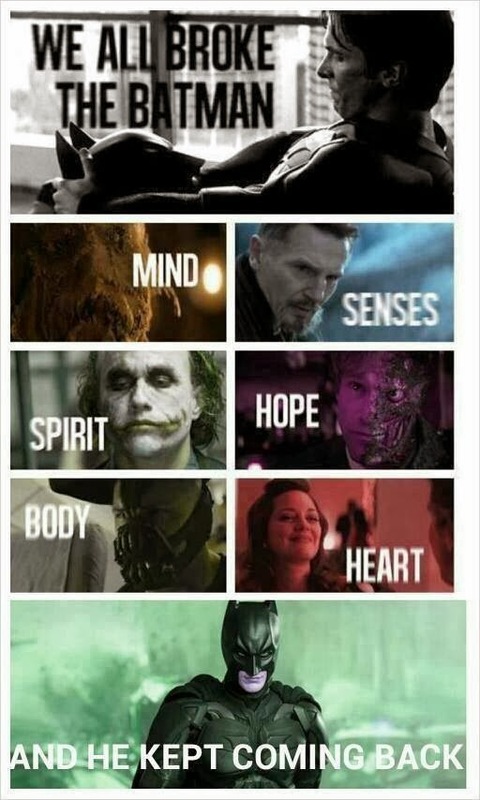 This is a super hero story, inspired by many, many such movies that I watched. I’m naming it “A White Knight”, after my favorite “Dark Knight” and a photo shared at Facebook (below). I’ll try and create each and every part as one episode – i.e., one story per episode, so people who miss one could still follow the next. This is not going to be a mega-series with lots of episodes. The frequency of the episodes depends solely upon my availability, so please don’t be disappointed (!) if I don’t write often. First part would be published shortly. As always, your feedback’s important! Please do leave them on the comments section!